Fate has not been kind. Not in the slightest! In the course of the Game of Thrones series, House Targaryen and House Stark have both endured some tough hardships over the years. Daenerys Targaryen suffered the loss of her family, her right to the throne, and her home. The Lannister family has been whittling away the Stark's power through subterfuge and trickery. Things were looking grim for both families, but now it's time for them team up against the dangers of Westeros! It's time to unite the Stark and Targaryen Houses! 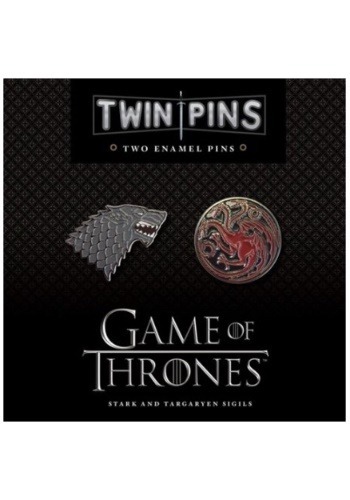 This Game of Thrones Enamel pin set includes 2 pins. They're officially licensed from the HBO series and each one has a rubber backing with a pin. One pin has the dire wolf symbol of House Stark, while the other features the dragon symbol of House Targaryen. Why support just House Stark or just House Targaryen? You can become an avid supporter of both Houses when you wear these pins! Add them to your backpack or hat, or you can even add some authenticity to your Game of Thrones cosplay when you add them to your Jon Snow or Daenerys Targaryen cosplay costume.